So my obsession with Perfumes was at its peak. However, I didn’t want to purchase them locally because they’d be more expensive and I wouldn’t receive anything else with them (as a gift with purchase or loyalty points or whatever else) no matter how extortionate the price was, and and I wouldn’t know if I was getting an older batch (potentially expired) and worst of all, I wouldn’t know if they were fake or not, but mostly I was anxious about purchasing locally because of this (Perfume Fail). If I bought them online, they’d be new, less expensive and more often than not, I’d receive a gift with purchase or samples or something. However, I wouldn’t be able to give them a sniff beforehand, and based on previous experience, I’m not really the luckiest when it comes to blind-buys. Even though I’d love to, I couldn’t sign up for those monthly subscription boxes (such as Scentbird and the like) because the cost of shipping to Kuwait via Aramex, would add up to something ridiculous. In comes MyPerfumeSamples.com which was exactly what it sounded like! 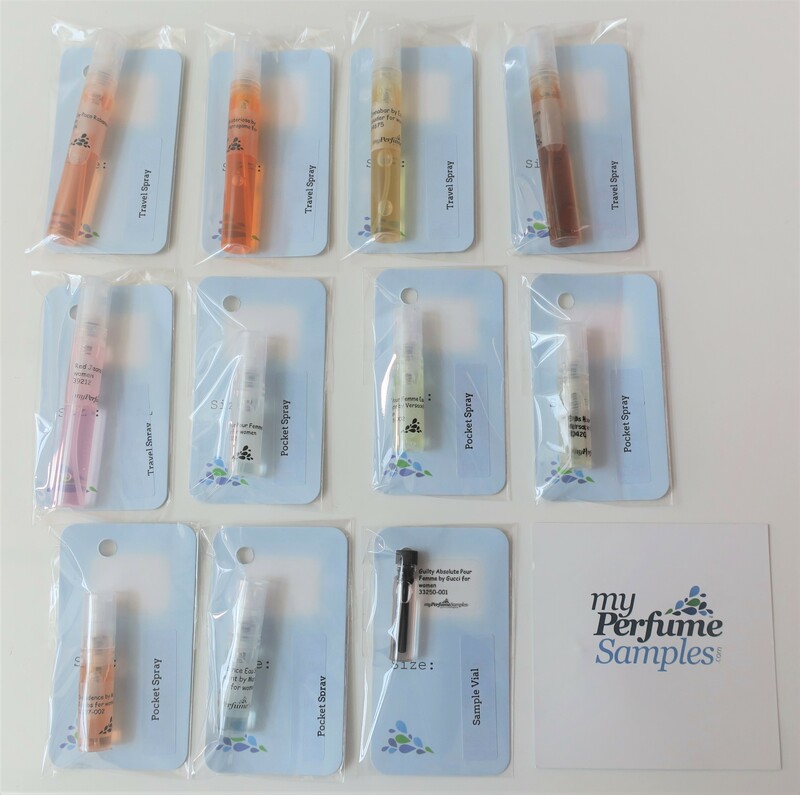 You pick out the scents that you wanted and the sizes that you preferred (with the pricing varying from scent to scent) and they’d ship them over. Up on the website, each scent had the fragrance notes and the year it was released and so on, listed next to it. I purchased a handful, in varied sizes. 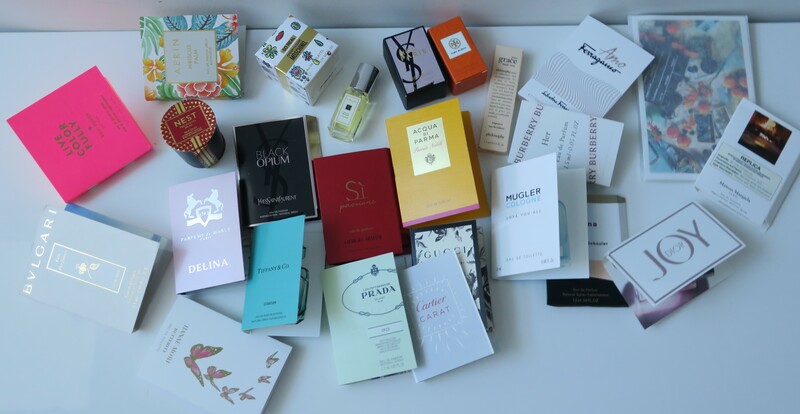 I guess I should be grateful that I spent KD 107/250 ($354) instead of KD 155/750 ($700) on these perfumes (perks of purchasing them during the Perfume & Makeup Exhibition), but I’m more bummed out by the fact that each and every one of them was not what I was expecting. To be fair, the scent of Reb’l Fleur by Rihanna was everything I’d hoped for and more! It’s just that the other items in the Gift Set were suspect and the box itself smelled like a small animal had crawled in there to die. I’d gotten tricked into purchasing the newer Elie Saab Perfume, which was Girl of Now Shine (gold petals on the bottle) instead of Girl of Now (which had blue petals on the bottle and was the the one I’d actually wanted). 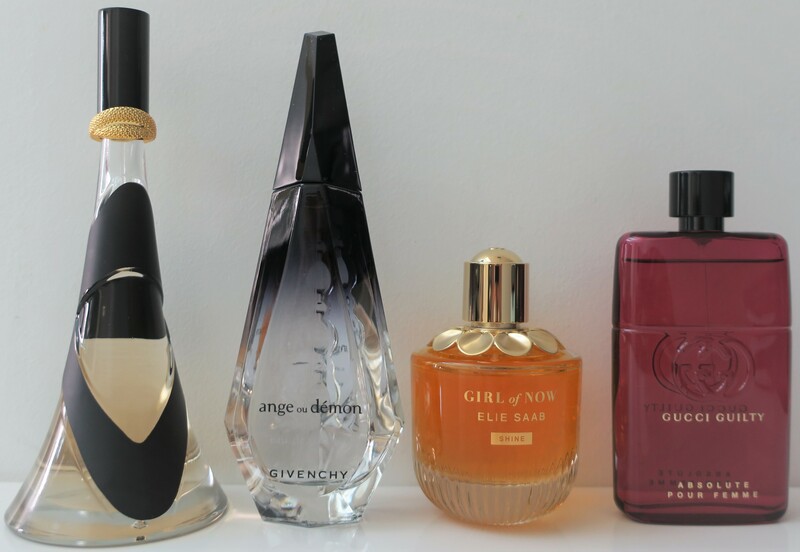 As for Givenchy Ange ou Demon, I was expecting it to have somewhat similar DNA to the flanker I’d grown to love, called Ange ou Demon Le Secret Elixir (review here), but they had pretty much nothing in common. Gucci Guilty Pour Femme was just an all around mess (it didn’t know whether it wanted to be floral or gourmand or woodsy and masculine). At the Perfume & Makeup Exhibition (here), I actively sought out the Gucci booth to purchase the infamous Gucci Guilty (obnoxious gold packaging). I thought it would be a nice substitute for my Carolina Herrera 212 VIP (reviewed here) which I’d finished up awhile ago and also happened to have equally obnoxious gold packaging. That said, Carolina Herrera 212 VIP smelled expensive in the sense that, to me, it brought images of vasts amount of money to mind (I don’t know how my brain works, ok?) and I wanted something similar, ergo, Gucci Guilty Eau de Parfum. Even though it wasn’t new at all (released in 2010) and I hadn’t given it a sniff before, I was sure it would be a perfect replacement! My latest trip to Sephora was quite eventful! For starters, I lost my White Sephora Card, again. So, I had to sign up for a new one, all over again. I used the same e-mail and phone number, so I’m hoping that the points got transferred (forgot to check). 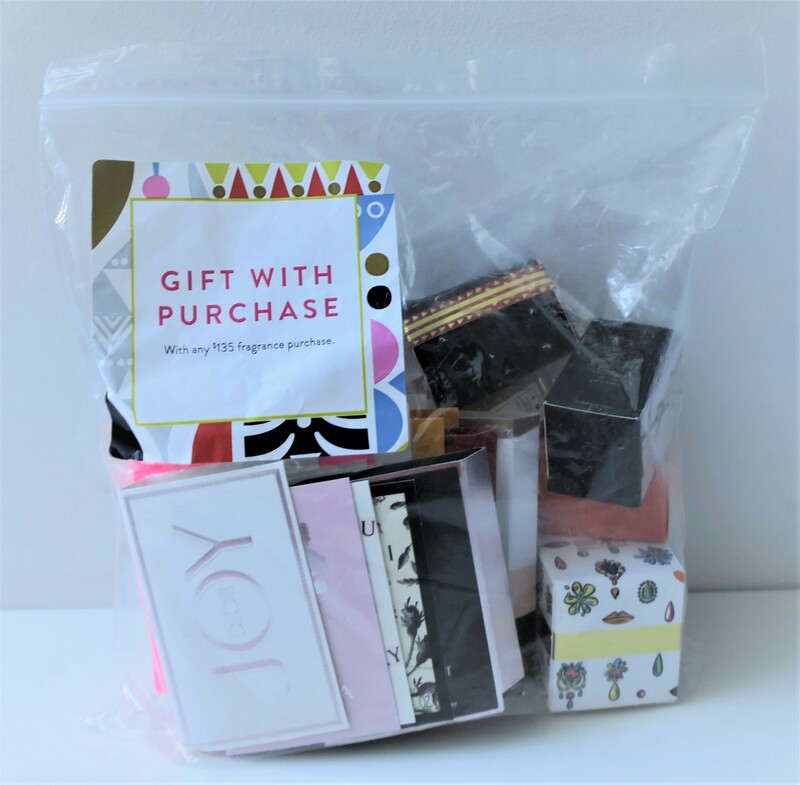 If not, that’s still okay, because I purchased no less than 3 perfumes as birthday gifts (2 girls, 1 guy) which will definitely help me rack up the points to get upgraded from a White Sephora Card to a Black Sephora Card (deets here) that much faster. The perfumes are not shown because I already gifted them to the recipients. I did ask for some fragrance samples (because buying perfumes for others kinda’ made me wanna’ play around with some of my own) and surprise surprise, they’d “just ran out of samples“. However, I was promised that my perfume picks would get decanted into tiny little vials in lieu of fragrance samples (which made me happy)! Plus, I got everything shown in the photo above as a gift with purchase (unprompted) which put a hole in my samples theory (mentioned here) where I mistakenly thought that if you purchased skincare and makeup-y bits, you could only get skincare samples and makeup-y samples, and if you purchased perfumes then you could only get perfume samples. Apparently, the Sales Assistants just hand out whatever to whomever, whenever.